Trump has the power to replace her at any time. This lack of transparency is apparently a result of the president’s failure to appoint his people to executive positions. Trump knows controlling the human resource department is key to managing the federal bureaucracy. In fact, Trump forecast this type of institutional resistance in his inaugural address. 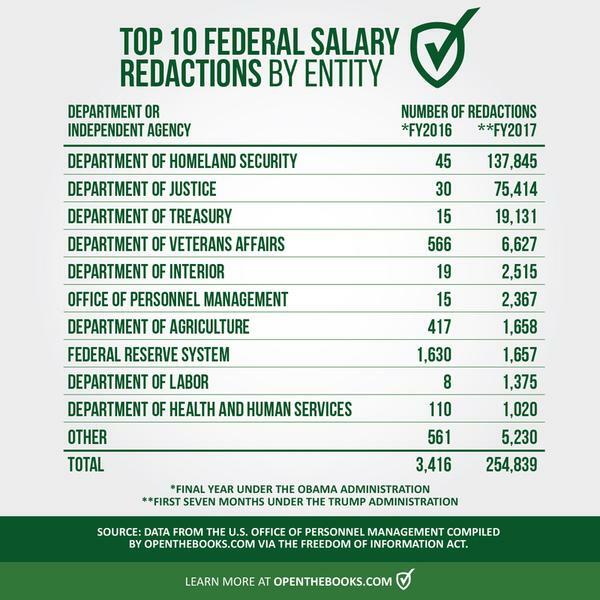 The decision to redact 255,000 federal salaries for $20 billion in payroll harms oversight. The American people deserve to know who makes how much, in what position, employed by which agency. For example, more than 6,600 salaries were redacted at the Department of Veterans Affairs. At an agency where hiring priorities have been repeatedly questioned, transparency is crucial. In recent years, just one in 10 new hires at the VA was a doctor. In FY2017, the VA hired 8,727 new employees and just 561, or 6 percent, were doctors. 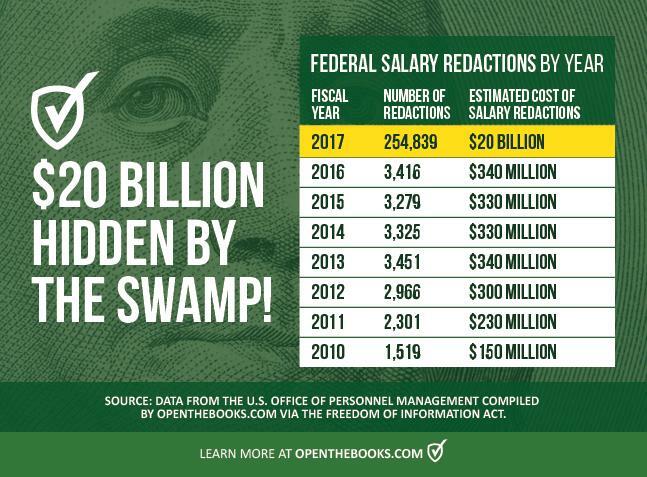 In December 2017, our “OpenTheBooks Oversight Report – Mapping the Swamp, a Study of the Administrative State” found $114 billion in compensation paid to 1.35 million federal civil service employees (excluding the U.S. Post Office) in fiscal year 2016. We found 165 percent growth in bureaucrats making $200,000 or more; 30,000 bureaucrats out-earning all 50 governors at $190,000; and the average salary at 78 large federal agencies exceeding $100,000. At OpenTheBooks.com, citizens have the tools to investigate their local piece of the federal bureaucracy. We have literally mapped the swamp, pinning all federal disclosed bureaucrats plus post office employees by employer location ZIP Code on our interactive map. But not this year. Our organization can’t properly quantify the FY2017 payroll because of the massive salary redactions. After all, we can’t map what we can’t see. Make no mistake – even under the Obama administration, too much information was redacted. 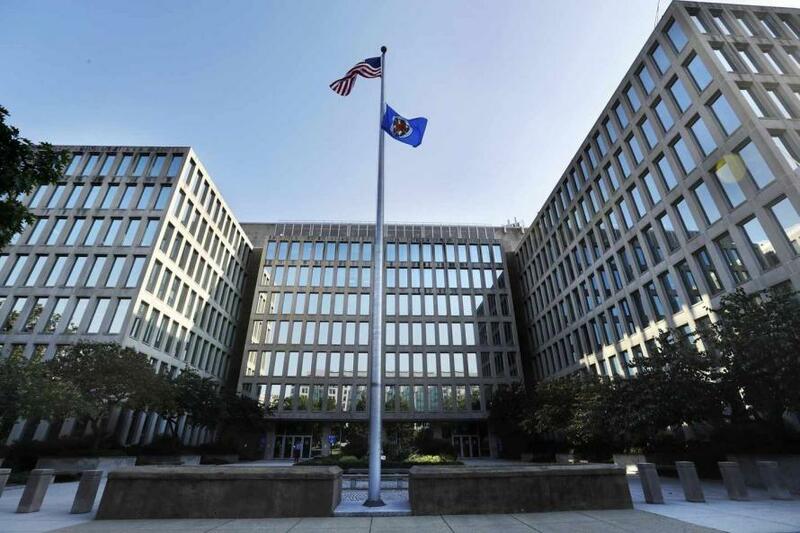 Last year, we complained about the 314,890 redacted employee names, including all 77,000 employees at the Internal Revenue Service and the $1.1 billion in “performance bonuses” shielded by federal union agreements (FY2016). We worked with Congressman Ron DeSantis on The Taxpayer-Funded Pension Disclosure Act, which would open the books on $125 billion in federal pension data. This didn’t make much sense, so we asked again. You can read the agency’s third attempt at a response via its spokesperson here. Facing resistance like this, the president has to work hard to deliver on his promises. The administrative state was designed to resist reform. Without a constant effort, the bureaucracy always wins.